Ferguson, Missouri—You no longer need a map to find this place, just an Internet connection. The phrase “Ferguson, Missouri” draws 25.4 million results when put into Google. Nearly anyone who was a resident of planet Earth the past couple of months knows why. Yet while fate conspired to deal Ferguson a horrible and shattering hand back in August, this resilient community has taken that misfortune and used it to begin the process of building something vital, something powerful, something enduring—something that may at last move this country kicking and screaming toward multiracial understanding and equality. Once that first visceral explosion of righteous outrage passed following the killing of Michael Brown Jr., the CNNs and MSNBCs turned off their cameras, packed up their gear and went home. Out-of-town pundits put away their bullhorns and moved on to new photo ops. The world was surely left to presume that was the end of that for Ferguson and its legacy. But the world was wrong. Ferguson is again starting to make history, and for all the right reasons. Michael Brown wasn’t supposed to matter. He was a young African-American male still very much in search of himself, an imposing 6’4” and 292 pounds of what many described as gentle, if rough-hewn, charm. He was also an 18-year-old kid who had just graduated high school and was messing around with his pal Dorian Johnson shortly after noon on that hot Saturday, when he had his lethal date with destiny. Brown was walking down the middle of Canfield Drive on August 9 when he refused an order by Officer Darren Wilson of the Ferguson Police Department to move onto the sidewalk. Depending on the account, Brown either reached for Wilson’s weapon through his window or simply took off running, along with Johnson. The officer got out of his vehicle and pursued the unarmed Brown, who after being shot twice was said by witnesses to have stopped in his tracks, turned around, raised his arms in surrender and stumbled a few feet toward Wilson and his drawn weapon. Several more bullets tore into Brown’s arm, head and eye socket, literally blowing his brains out. He fell dead into the street. And there his body lay as it bled out. The police tape went up, cordoning off the area. A crowd gathered. Brown’s own mother was denied access to her son’s corpse. A social media barrage began to fly out over Twitter and Facebook. A stunning 4½ hours would pass before Brown’s body finally was removed from the scene—tossed into the back of a pickup truck. But an amazing thing happened to Michael Brown in those earliest hours following his tragic death. At the moment it occurred, he was an anonymous statistic in a country where an unarmed black person is killed every 60 hours by law enforcement, security guards, or vigilantes claiming self-defense. Yet as Brown’s body lay prone, a movement ignited that grew stronger with each agonizing tick of the clock. Nearly a week of angry protests, unrest and rancorous clashes with police would follow beginning the next day. Television news was all over it. State troopers were called in, followed days later by the National Guard. Molotov cocktail-tossing anarchists, endeavoring to stir the pot and incite police hostilities, merged with peaceful protesters seeking justice. Soon, images of police toting shields and clad in riot gear began filling TV screens. Tear gas and rubber bullets were fired into crowds. Tales of looting followed. Missouri Governor Jay Nixon declared a state of emergency. Journalists were attacked and arrested. Even President Obama was obliged to make a plea for calm. If not for the heroism of members of local and national clergy forming a human wall between protesters and police to quell the violence, the toll in arrests, injuries and destruction would have proven significantly greater. For a geographic point of reference, Ferguson sits less than 10 miles from the bustling metropolis of St. Louis. Its mood was gauged a month after the tragedy unfolded, beginning with a sojourn to Ground Zero—the intersection of Canfield Drive and Coppercreek Road where it all went down. A gentleman named Darnell Walker happened to be hanging nearby. Walker is a youth football and baseball coach with nine children and 13 grandchildren of his own, along with a boa constrictor named Bo that he likes to carry around his neck. He lives right behind the QuikTrip convenience store and gas station that was destroyed one night by looters and is now boarded up, just up the street from the similarly boarded Red’s Barbecue restaurant. A memorial populates the area where Brown was felled, tended to with teddy bears, fresh flowers, and signs bearing messages like “Rest in Paradise Mike Brown.” While at the site, a woman behind the wheel of a late-model sedan stopped, glanced up, looked over at the memorial, crossed herself and bowed her head before driving on. What Freedom encountered in the larger Ferguson—a sleepy suburban community of 21,135—was a suddenly resolute determination born of long-simmering hopelessness and frustration, and festering wounds wrought by discrimination in a town where 67 percent of the residents are African-American while only three of the 53-member Ferguson police force are black. Besides feeling as if they have bull’s-eyes on their chests, blacks in the town experience greater than 20 percent unemployment and what is perceived to be an unfair system of ticketing and fines, resulting in the poor (and predominantly African-American) residents subsidizing city facilities and services. The embittered and antagonistic relationship between local law enforcement and the black community set the stage for the detonation that followed. 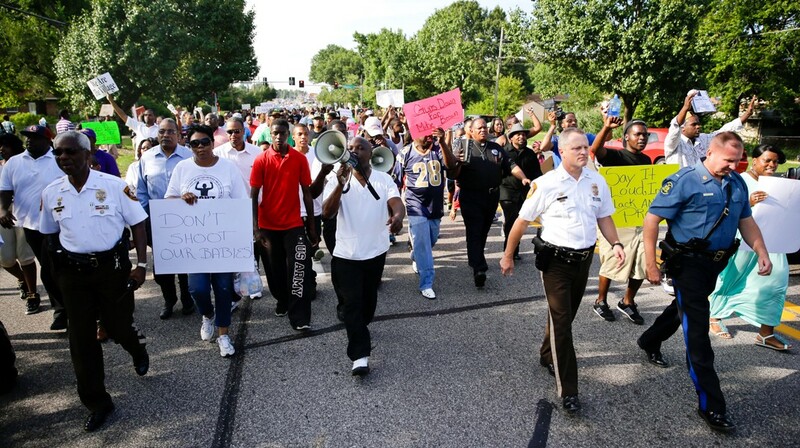 The citizens of Ferguson, Missouri, took to the streets in anger following the tragic events of August 9, culminating years of frustration and despair that have long festered in the town. Kevin Bryant, who backs the St. Louis initiative Stop the Killing, called the powerful reaction in protest to Brown’s death “the perfect storm” of elements in terms of the number of witnesses present, the way it was handled by police at the scene, that it happened on a weekend, and the circumstances of the clash between Brown and Wilson. The ramping up of the conflict into a face-off seemed to catch everyone by surprise. Pictures of military-style weaponry on television and in print “made it look like we were suddenly living in Iraq,” observed community activist Eric Brown (no relation). Amir Brandy, one of the protesters in the line of fire, described getting hit with pepper spray and tear gas. “I found myself lying in a ditch pawing at my burning eyes and face,” he said. At the crux of the protests was the plea to replace St. Louis County Prosecuting Attorney Robert McCullough with a special prosecutor if he refused to recuse himself, given a perception of conflicted interests. However, McCullough showed no intention of stepping aside and turned the Brown case over to a grand jury to decide whether an indictment of Officer Wilson would be merited. Should those mulling Wilson’s fate opt for a No True Bill—the term for a decision not to bring charges—area leaders said they feared civil unrest similar to what met the police acquittals after the Rodney King trial in 1992 in Los Angeles. A judge recently granted an extension to January 7 for the jury to decide whether to file an indictment. This is where members of the clergy promise to play a key peacekeeping role, just as they did when clashes with police threatened to veer out of control. Religious leaders in Ferguson formed a human wall between police and protesters to keep the peace and prevent the conflict from escalating in the wake of Michael Brown’s death. 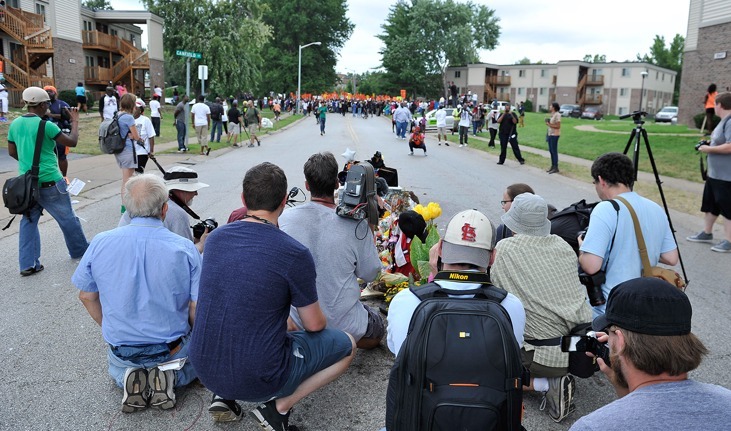 Faith leaders locally in Ferguson and St. Louis, and nationally, were a constant, calming and supportive presence during the August protests, taking to the streets to march alongside protesters and meeting with Ferguson city officials to discuss ways to help the community heal. Representatives of every faith banded together: Catholics, Baptists, Unitarians, Episcopalians, Seventh-day Adventists, Methodists, Jews, Scientologists and more. Many of the faith leaders penned a letter, signed by hundreds, to the mayor, police and citizens of Ferguson pleading for a return to dialogue and nonviolence following the worst of the clashes. When all attempts at mediation failed, clergy members were there on the scene during the nightly turmoil, forming a physical barrier between law enforcement and protesters at the times tensions threatened to boil over. NiCole Gipson, a local mother who with fellow mom Melissa Fitzgerald co-founded the group Parents For Peace—a diverse group of black, white and Hispanic parents working to keep kids shielded from the ugliness that sometimes surrounds them—believes Pastor Scott is being overly modest. Reverends Barry and Claire Coziahr of the Church of Scientology of St. Louis also took a stand, marching with other faith leaders, activists and a team of Scientology Volunteer Ministers. Throughout the turmoil they were joined by other local clergy and took to the streets, distributing copies of The Way to Happiness, a common-sense guide to better living written by L. Ron Hubbard. “That book has unified individuals across racial, economic and religious divides in communities across the United States,” said Coziahr. Marching in August with protesters on several occasions, religious leaders carried signs that read “We Are Praying With Our Feet” and “We Are The Village.” That very visibility is part and parcel of their calling, believes Rabbi Talve. “But it’s also important to stress that we are not the leaders of this movement, just a part of it,” she said. 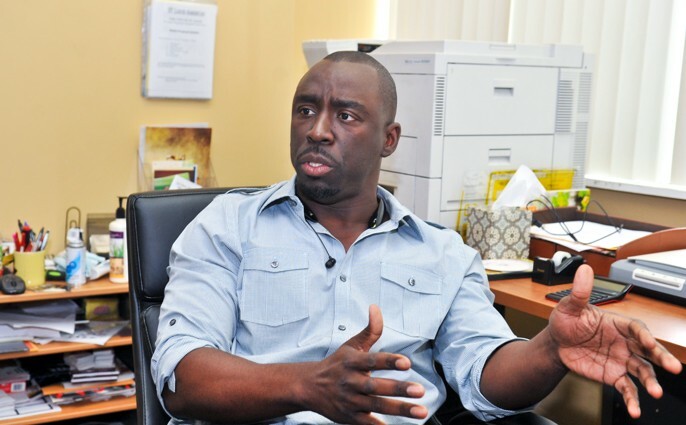 “The bottom line is that we all have a stake in what’s happening. What we can contribute most is to be a bridge that helps bring the police and the community together. The beloved woman of God shrugged off her work on behalf of the movement thus far, expressing as much anger as Godly diplomacy. The movement that grew out of the tragic shooting has mobilized into a diverse group with a unified message, that change is needed. 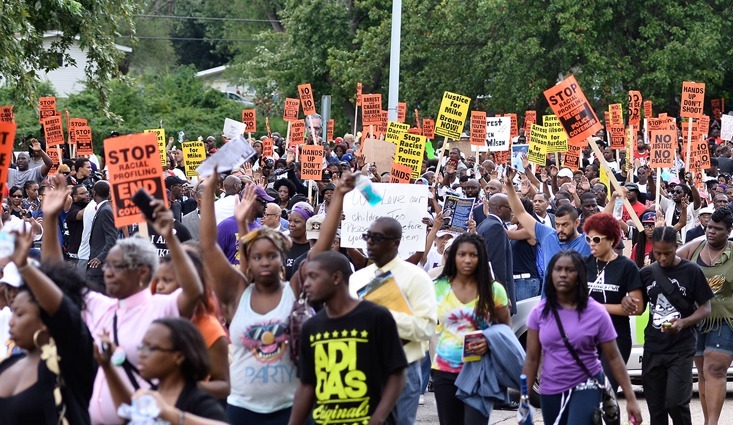 What is unfolding in Ferguson is nothing less than a burgeoning new civil rights movement. It is still very much in its embryonic stages, rife with the growing pains, leadership vacuum and generational split that go along with something so raw and new. But it’s happening. It’s real. And its message is one of equality. It is a nascent crusade that is really a microcosm of the need for racial change in cities and towns all over the United States. It is a struggle for basic rights as well as respect, representation and fairness. And as seen on T-shirts and bumper stickers all over St. Louis and Ferguson, the symbol of the crusade is no longer the defiant fist of Black Power but a pair of upraised hands with the phrase, “Hands Up! 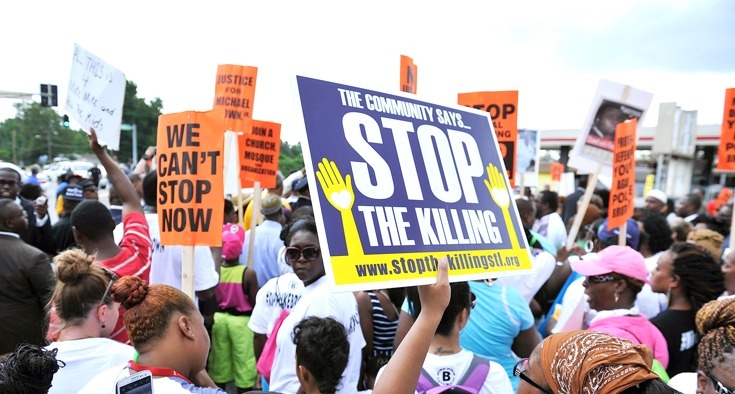 Don’t Shoot!” It’s an imploring message of unity with Michael Brown. A line of about 100 Missouri state troopers in riot gear formed a wall, threatening with arrest anyone who tried to block traffic on the highway. Yet even those, like me, who were simply milling about and peacefully observing were accosted. I crept too close to one policeman’s baton and was rewarded with a purposeful smack on the arm. Police arrested a total of 35 this day. However, I later learned part of it was connected to a larger movement plan, with protesters bearing clean records volunteering to be arrested and bail money set aside in a fund. The grassroots spirit of the cause is embodied in the activists known as Lost Voices, a group of young men and women who have dedicated their lives to keeping the momentum launched by the original protests moving forward. Lost Voices founder Steven Wash and a few cohorts started the group by sleeping in chairs on the pavement of West Florissant Avenue in Ferguson near the site of the shooting. They stayed there every night, no matter the weather, adding sleeping bags and then tents through contributions and scheduling nightly protest marches for all to join in. Defense attorney Jerryl Christmas, a member of the nonprofit Justice for Mike Brown Leadership Coalition, wants to see equal justice for his clients, regardless of their race or color. Lost Voices organizer Charles Wade said the original goal was to pressure prosecutor McCullough into conducting a proper investigation of Officer Wilson. But many people want to make sure interest in their cause does not fade and say they could stay on the street indefinitely. In the first week of fundraising, they generated $23,000 and inspired State Senator Maria Chappelle-Nadal to spend two nights with them in one of their tents in a show of solidarity. That commitment also comes with some harassment. On one occasion, they woke up to find a noose hanging from a pole. But they were undeterred. “They’re committed to turning a moment into a movement,” Wade said. 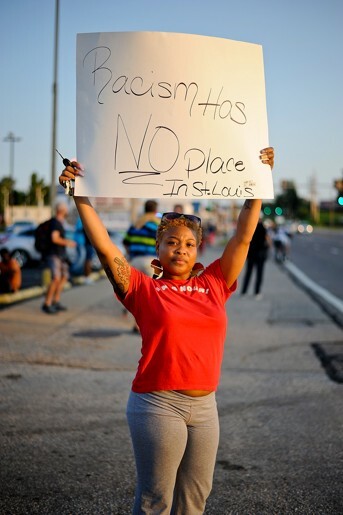 It can be found in the work of Gipson and her Parents For Peace, who have made the school of her teenage son a safe haven in the name of Michael Brown and teamed up to make signs welcoming local children back to school in the middle of the protests. And it can be found in the art and outreach of Cbabi (pronounced “Kuh-Bah-bee”) Bayoc, his name an acronym for Creative Black Artist Battling Ignorance (Cbabi) and Blessed African Youth Of Creativity (Bayoc)—a name he adopted in 1997, changing it from Clifford Bernard Miskell Jr.
Bayoc—like Brown a strapping 6’4”—took his children to a local mall parking lot in the wake of the Brown shooting and they each drew chalk outlines of bodies in which they wrote the names of people killed while unarmed. Bryant, for one, is pleased that the baton of this movement has been passed from the elders to the young people who have driven it from the outset. “They need focus, they need direction, they need leadership, but they’re out there and doing it and I’m proud of them,” he said. In Ferguson and St. Louis, many of those with whom you speak evoke a certain pessimistic inevitability in the quest for justice in the Michael Brown tragedy. In short, it isn’t expected to come. 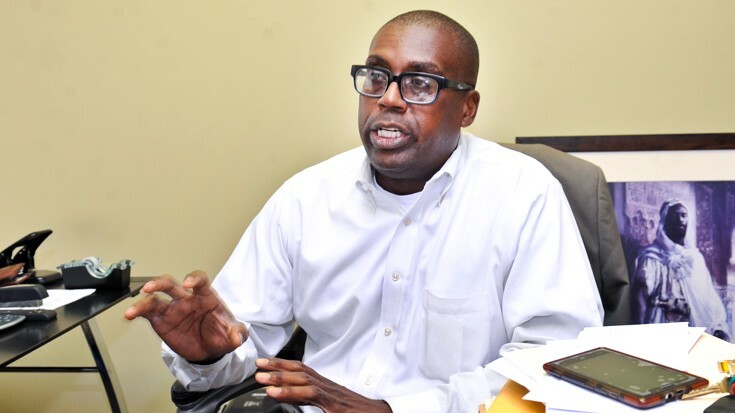 “As a former prosecutor, I have no faith that the state is going to pursue charges in this case the way it’s being presented now,” Christmas admitted. Too, a GoFundMe page set up to support Officer Wilson raised more than $400,000 before being shut down early in September. But the truth is that what has been launched in Ferguson is already far bigger than one man, one event, one city. Should the sought justice fail to come, the eyes of the nation promise to remain on a bigger prize. That already has been made clear by the support shown the rising movement by other ethnicities. 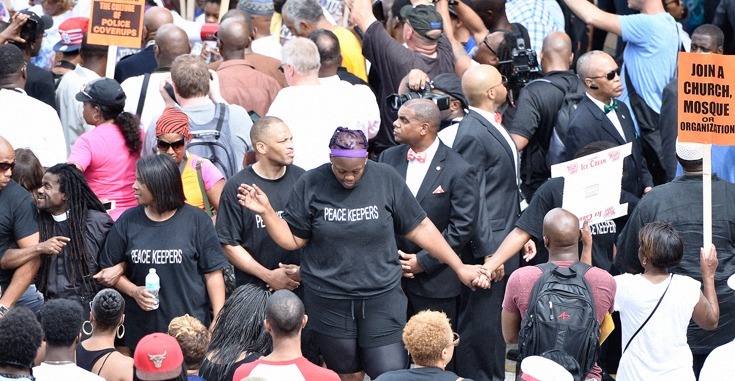 If a young man’s death can bring people of every color together in a unified call for multiracial respect and an end to racial profiling and targeting, it certainly will not have been in vain, agrees Minister Donald Muhammad of the Nation of Islam of St. Louis. Perhaps the bottom line is that a young man who barely was able to graduate high school has already managed to change the world.